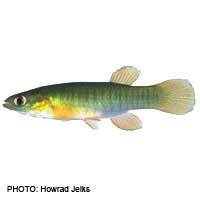 Brilliantly coloured and highly active, killifish are an enduringly popular choice for the tropical aquarium. They're highly adaptable and comparatively hardy, with varieties suitable to almost every kind of tank set-up. Happy in large shoals but mostly too small to need a lot of space per individual, they're easy to please and easy to be pleased by. Killifish are generally peaceful by nature and can get along well in community tanks with other small or non-aggressive fish. The males can however, be aggressive towards each other, so it's best to keep just one male per killifish species per aquarium, and to avoid keeping species which look similar. Any number of females will be happy together. Killifish prefer a well-planted tank with lots of hiding places, and you should make sure that the hood is secure, as many of them like to jump. They're happiest in fairly shallow water with some floating plants to obscure the surface. Killifish prefer live food, and will take most kins which are small enough for them to eat, including daphnia, river worms and small crustaceans. They enjoy live insects, but you should not be tempted to capture these from around your home or garden, as this risks introducing toxins and disease to the aquarium. Most species can be persuaded to accept flakes, though for best results you should supply them with a varied diet. Lyretail Killifish - Among the most popular and long-lived killifish, these elegant little fish prefer slightly acidic water and subdued lighting. They can be very shy and take time to feel safe enough to feed. Medaka - These Japanese killifish are available in shades of white, yellow, gold and glow-in-the-dark green. They are famous for being the first vertebrates ever to breed successfully whilst orbiting around the Earth. Bluefin Notho Killifish -These very short-lived but hardy little fish are particularly prolific breeders. They are available in several colour varieties. Rainbow Killifish -With distinctive bright red colouration, these are among the largest species of killifish and are comparatively easy to maintain in the aquarium. Ceylon Killifish -Larger and hardier than most of their kin, these fish can also be more aggressive, but will be calmer if given plenty of hiding places. Striped Killifish -Comparatively long-lived, these peaceful fish prefer cooler water. They are particularly active and fond of jumping. One of the reasons why killifish are so popular with aquarists is the ease with which they can be bred. The males are easily distinguished from the females by their brighter colours and they often have longer, narrower bodies. Killifish can be divided into two reproductive types: annual and non-annual. Annual killifish should be provided with a small breeding tank with a sand or peat moss substrate in which they will bury their eggs. The water should then be removed from the tank (along with the parents!) but the substrate should be kept warm and moist for one to four months (depending on the species). After this period, water can be added again, and the fry should begin to hatch. This mimics the way that these killifish lay their eggs in temporary pools in the wild. Most of these species only live long enough to breed once. Non-annual killifish can be bred in a more ordinary breeding tank with lots of fine-leafed plants or spawning mops for their eggs to attach to. The parents should be removed immediately afterwards to stop them from eating the eggs.Killifish fry can be fed with infusoria and commercial fry food preparations. Within one to two weeks they should be ready to eat finely ground flake food. With their fascinating habits and their brilliant colours, killifish are a delight to own. Provided you have no fish big enough to consider them as prey, they're a great choice for your aquarium.